DEA Bravo HD Horizontal CMM - CMM Inc.
DEA BRAVO is a family of horizontal-arm measuring machines. A cost-effective automatic system, the DEA BRAVO HD is designed to optimally tackle a wide variety of metrology applications. It offers a consistent and efficient approach to car-body inspection and incorporates innovative industrial measurement technologies into asingle-arm and double-arm horizontal structure. 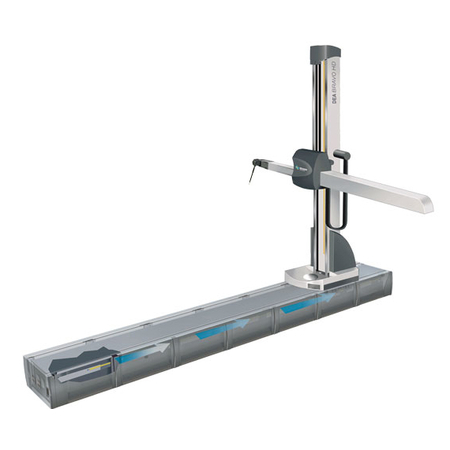 The BRAVO HD is an extremely effective and versatile coordinate measuring machine; it is suitable for metrology labs,QC rooms and Meisterbock rooms. It is also appropriate for flexible and accurate dimensional inspection of thin-walled components – such as bodies-in-white, chassis, subassemblies, panels, car doors, dashboards, castings, structural aircraft, ship and railway components. The BRAVO HD’s distinctive design includes a stable, precise mechanical structure, an integrated temperature compensation system, a wide range of probes, probe heads, wrists and accessories and a state-of-the-art software package. Furthermore, the system is fully made of steel, to ensure high structural stability in all environments. All axes use recirculating ball-bearing pads, sliding on high-precision guideways and the unique backlash-free horizontal-arm counterbalance keeps the load centered on the mobile carriage. This reduces the mechanical deformations of the carriage itself. The open structure can be embedded flush with the floor and the walkable covers on the longitudinal axes guarantee optimum access to the measuring area. The BRAVO series are offered in either single or dual arm configuration.